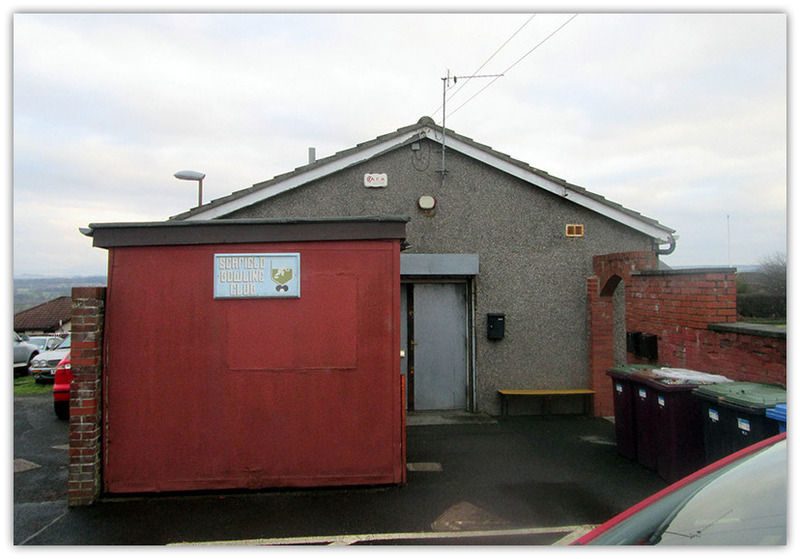 This is in Seafield West Lothian Community Centre. I understand this was paid for by workers at Seafield Oil Works but I do not know if it was exclusively for people who worked there or if it includes other folks from the village. 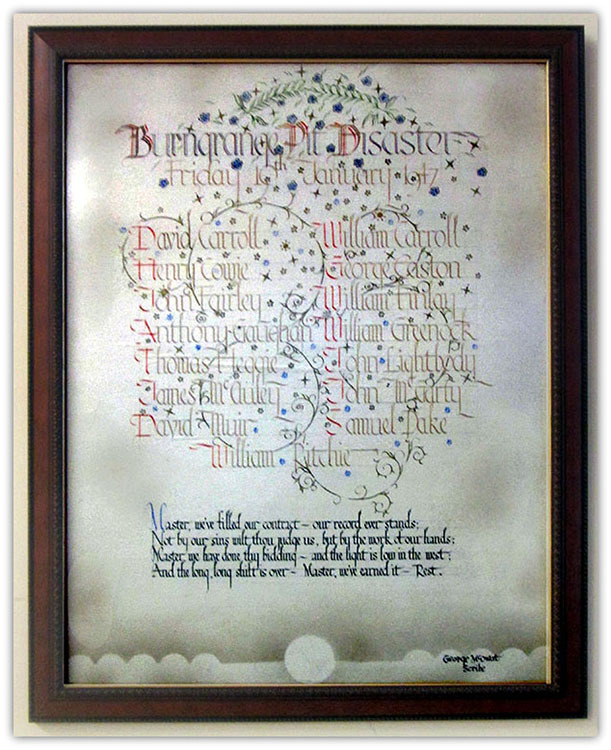 I have included it as a mining related memorial and will do so unless advised to the contrary. Copies of this are in Seafield West Lothian Community Centre and the Seafield Bowling Club. 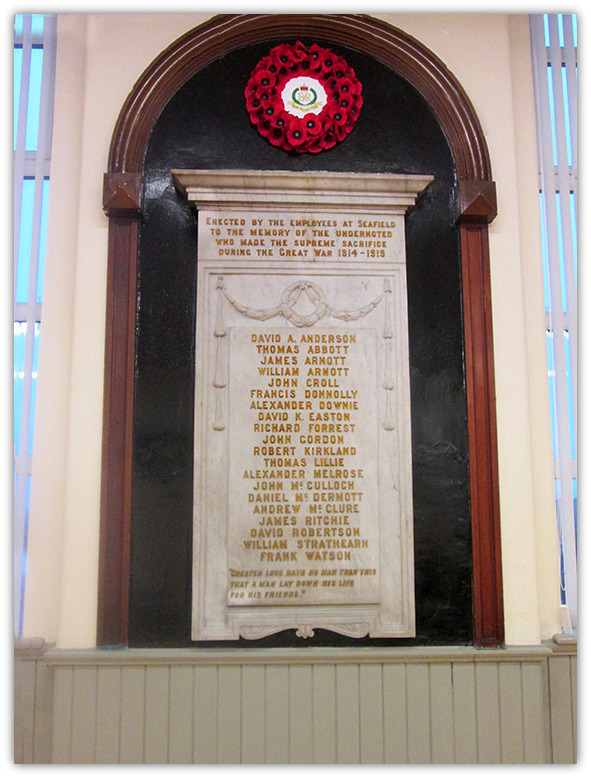 It is a memorial to the men killed in the Burngrange Disaster. SEAFIELD. Kirkaldy, Fife. 10th. May, 1973. 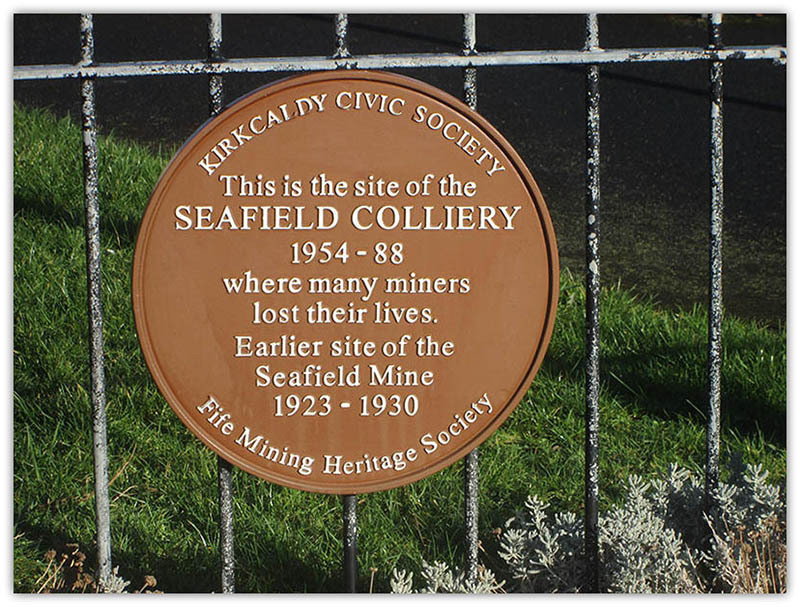 The Seafield Colliery was situated on the southern outskirts of Kirkcaldy and worked the measures beneath the Firth of Forth which dipped between 1 in 3.2 and 1 in 1.4 with workings in the Productive Coal Measures both above the Millstone Grit and the Limestone Coal Group. Two shafts were sunk at the colliery in 1954 and were 24 feet in diameter, lined with concrete. Insets were made at 170 fathoms and 300 fathoms and horizon mines were driven for two miles to the south cutting with all the seams under the Firth. A stone mine was driven for one and a quarter miles from the 170 fathoms horizon mine and for one mine from the 300 fathom horizon mine, to allow development of the No.2 Sub-Crosscut are. The mine was ventilated by a Howden Centrifugal fan at the top of the No.1 shaft which extracted 350,000 cubic feet of air per minute at eight inches water gauge. 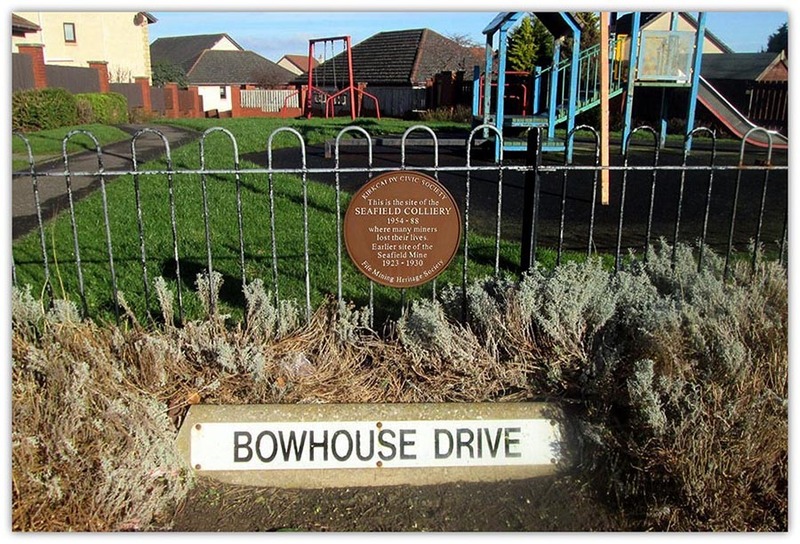 At the time of the accident the National Coal Board areas were still operating in Scotland certain appointments for an amalgamation of one area were already effective and the principle officials at the Seafield Colliery were the Area Director, J.R. Cowan, the Area Chief Mining Engineer, Mr. G. Gillespie, the Area Deputy Chief Mining Engineer (Mining Services), Mr. A. Ludkin, Production Manager, Mr. J. Gibb and the Colliery Manager, Mr. D.T. Paterson. Mr. J.C. Fox, the Deputy Manager had statutory responsibility as undermanager for the colliery and there were six statutorily appointed undermanagers. The undermanager in charge of the D.22 district in the Dysart Seam was Mr. J. Simpson. It was here that an extensive fall of roof killed five men and injured and trapped others. All the undermanagers worked on the day shift and on the afternoon and night shifts senior overmen were in charge of the mine Production began in 1965 and at the time of the accident the weekly output was an average of 26,000 tons with 2,100 men employed below ground and 300 on the surface. There were nine workable seams at the colliery with estimated total reserves of 85 million tons but apart from the first two faces, which were in the Five Foot Seam in the Limestone Coal Group, all the other faces had been in the Productive Coal Measures, the seams were, in descending order, the Barncraig, the Six Foot, The Bowhouse and the Dysart Main. At the time of the accident the output was from six fully mechanised faces, the Six Foot (S.02) longwall advance which produced 4,100 tons per week, the Six Foot (S.03) longwall advance which produced 4,100 tons per week, the Bowhouse (W.04) longwall retreat which produced 2,000 tons per week, the Dysart Main (D.09) longwall retreat which produced 7,200 tons per week, the Dysart Main (D.10) longwall advance which produced 6,100 tons per week, the Dysart Main (D.22) longwall advance which produced 1,000 tons per week and the development roadways which produced 1,500 tons per week. The D.22 face was the deepest of three faces that were intended to be worked to the South and after some difficulties that face commenced production on 24th. April 1973 but there was very little output before the accident because of problems with the powered supports and the grading of the face conveyor which had not been overcome when the accident occurred. Many of the supports were not pressurised against the roof. Small coal that was thrown over the shearer drums and spillage from the conveyor accumulated on the waste side of the conveyor to such an extent that the supports were sometimes set on a layer of small coal. The fall was 6 to 8 feet high and extended from support 90, which remained upright ad pressurised to the roof, to support 155 which also remained in the same position. All the supports between were toppled with the exception of 152, 153 and 154 which remained upright. The total length of the fall, which was the full width of the excavations was about 210 feet and with the exception of Hay and McDuff all of the men mentioned were trapped. A. Bell, overman and R. Stewart, face overman were in the main gate when the fall occurred at about 6.45 p.m. and because the face telephone was knocked outbye the fall, they had to inspect both sides before they could finds the full extent of the fall. Shortly after 7 p.m., Bell reported to the surface control centre that there had been a heavy fall on D.22 face and that men were trapped. J.C. Fox the deputy manager, was contacted by telephone and after making sure that the manager had been informed, he went to the colliery. Here he met J. Simpson, the undermanager and they both went inbye to D.22 collecting men on the way who could assisted in the rescue work. In the meantime, D.T. Paterson, the manager, arrived at the surface and put the emergency scheme into operation calling the rescue brigades and first aid workers. While Fox and Simpson were travelling inbye, they met a stretcher part bringing McCartney out. He had survived and escaped unaided from the centre of the fall by walking through the waste behind the powered supports to the tail gate roadway. He gave the approximate location of the trapped men and confirmed that they were still alive. Fox and Simpson found it impossible to pass along the face between supports 90 and 152. Simpson took charge of the operations on the top side of the fall while W. Kerr, an overman, took charge below it and attempts were made to reach the trapped men over the top of the fallen stones. Wood chocks were erected on the stones but this proved to be too difficult and dangerous because the foundation was too insecure and there were large overhanging stones on the side of the face. Fox was joined by I.L. Davies, H.M. Inspector of Mines and Quarries and J, Gibb the production manager who had been alerted by telephone through the emergency scheme. Shortly after 10 p.m. It was found possible to get to the top of the fall from the bottom side and an assessment was made of the situation. The unsupported roof of the cavity seemed smooth and strong over the entire area which was roughly 30 feet wide and 210 feet long. The fallen material was well laminated and there were massive slabs of stone mixed with stone fragments which made the floor uneven and because of the steep inclination, very dangerous to walk and work on. 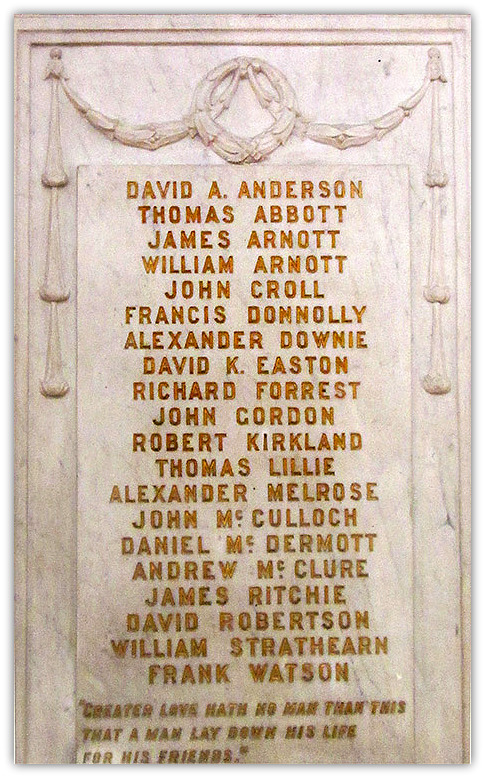 By 10.40 p.m. the first body was found at support 115 and was identified as Comrie. Nearby Henderson was calling for help and was released from within the main structure of the support and placed on a stretcher at about 12.30 a.m. on 11th. May. Oxygen was given from a reviving apparatus but he died almost immediately. Rescue attempts from the top side had to be suspended because material was sliding down on the men working at the bottom end. at support 123, Holmes and Todd were trapped by the structure of the support and while they were being released, Fox took a party up to support 135 where Dickson and Downes were released at 1.30 a.m. Guthrie was found dead in a position between the supports immediately above Downes and Dickson but his body could not be recovered at that time. Holmes died soon after being released. No trace could be found of T. Kilpatrick who was presumed to be dead and buried under the massive stones at the lower end of the fall and because of the steep slope and the dangerous conditions the only hope of recovering his body was to work systematically down the face from the top end. The work was started almost immediately with steel arched girders erected close to the end of the coal face and spanning the face conveyor. Progress was slow as the girders had to be bolted to the roof and the solid ground over the face. At about 8 a.m. on Saturday 19th. May, Guthrie’s body was recovered and taken to the surface not Kilpatrick’s body was not recovered until 3.30 p.m. on 6th. June. It was found 16 feet from the waste side of the conveyor near support 109. 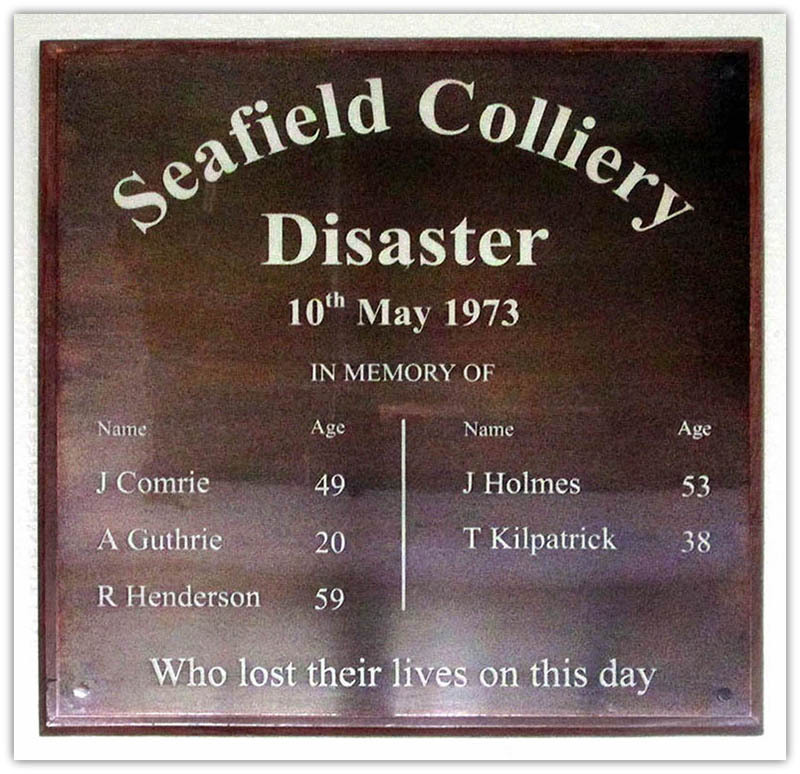 The inquiry into the disaster was conducted at the Technical College, Kirkcaldy, Fife on 8th. August 1973 and lasted for seven days.it was conducted by Mr. J.W. Calder, C.B., O.B.E.,B.Sc.,C.Eng., F.I.Min.E., H.M. Chief Inspector of Mines and Quarries and the report was presented to The Right Honourable Peter Walker, M.B.E., M.P., The Secretary of State for Trade and Industry on the 19th. November 1973. “An extensive a fall of roof occurred on D.22 face in the Dysart Main seam extending for a distance of about 210 feet and displacing 61 powered supports. The fall started near powered support No.90 when the roof beds in the waste broke down heavily and over-ran several powered supports on the face line at a point where there were natural slips in the roof. Bed separation of the immediate roof strata had already taken place at a well-defined smooth parting 6Å to 8 feet above the seam, and the effect of the first fall was to release the detached roof which broke over the coalhead and collapsed so that large blocks of roof stone slid down and reeled out the supports, pushing then downhill and backwards into the waste. There followed a progressive collapse of the roof on the rise side. The supports were set on an irregular floor with varying thickness of spillage coal underneath them and many were not fully pressurised to the roof. In addition, 12 were not connected to the conveyor, because of this they were not sufficiently stable for the inclinations on which they were in use. Much of the trouble arose because the horizon control difficulties with the power loaders but the development of the face heading to a height in excess of the maximum extended height of the powered supports was unsatisfactory. The supports could not be fully pressurised to the roof and this allowed bed separation to occur as the face moved away. The development of the face at an angle lead of 17 degrees produced a steep inclination in the line of advance and this contributed to the instability of the supports and the ease with which they were pushed back into the waste. Planning arrangements did not ensure that the most stable supports available in the area were reserved for use in D.22 face. The Committee formed to study all aspects of the working of steep seams in coal mines should give priority to the design and development of a purpose built powered support for use on steep faces. The National Coal Board should examine critically its planning arrangements to ensure that the most suitable type of support is selected for steep faces. 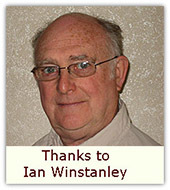 The arrangements for the approval of powered supports under Regulation 16(2) of the Coal Mines and Other Mines (Support) Regulations 1966 should be revised to ensure that all supports used on faces in steep seams are subjected to additional tests which simulate the conditions under which they will operate. All power loading machines used on steep faces should be fitted with steering under frames and consideration should be given to their automatic operation. The research to improve the design, loading characteristics and shielding of shearer drums should be given a higher degree of priority. The arrangements for supervision by underground officials at modern highly mechanised mines should be reviewed to ensure that consultation at change of shift is adequate and that an official, statutorily appointed as an undermanager is on duty on all production shifts.